Need information about DON in corn? 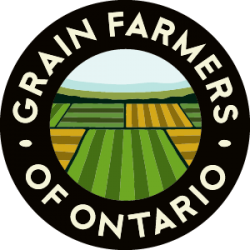 GUELPH, ON (December 17, 2010) – The Ontario Agri Business Association (OABA) and Grain Farmers of Ontario (GFO) are pleased with the recent changes that OMAFRA has made to the deferred payment regulations that are effective immediately. As a result of this regulatory change, it is “business as usual” in producer/elevator arrangements regarding deferred payments. This change in regulations provides relief from the “non compliance” status of deferred payment arrangements between elevators and producers through until July 1, 2012. Elevators and producers entering into deferred payment arrangements will not be subject to compliance or enforcement activities by Agricorp. However, other provisions of the Grains Act will continue to be enforced. It is important to note that any deferred payment arrangements entered into going forward between a producer and elevator should not have a settlement date that extends beyond July 1, 2012. OABA and GFO would like to thank the Minister of Agriculture, Food and Rural Affairs, Carol Mitchell, for her swift action in making the necessary regulatory change to facilitate deferred payments until a permanent solution is reached. This regulatory change is a result of OABA’s and GFO’s shared success in raising the importance of this issue within OMAFRA and Agricorp, resulting in productive meetings and this short term resolution. Early in 2011, representatives from OABA and GFO will meet with Agricorp and OMAFRA again to develop a strategy for addressing this important business practice within the Grains Act with the intent to have this situation permanently resolved well in advance of the July 1, 2012 deadline. For more information, farmers are encouraged to contact Member Relations at GFO, Valerie Gilvesy (226-979-5581). Elevator operators/dealers should contact OABA (519-822-3004) for more information. GUELPH, ON (December 16, 2010) – Today, Grain Farmers of Ontario (GFO) launched its first mobile application, SellSmart, for BlackBerry® smartphones. Providing local price information, head-to-head price comparisons, and price alerts, this mobile application will change the way Ontario farmers do business. SellSmart is a custom application designed to put local price information at farmers’ fingertips. The price data for corn, soybeans, and wheat from the Chicago Board of Trade is adjusted with basis information from local elevators across the province and provided on a ten minute delay. To streamline the data, the application is personalized by the user to only display their elevators and commodities of interest. 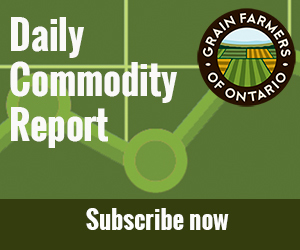 real-time updates on market prices, giving them a stronger negotiating position,” says Erin Fletcher, Manager of Public Affairs and Communications, Grain Farmers of Ontario. The application also incorporates an alert feature for each crop and elevator. The user is able to set a target price they want to sell at and be notified by their BlackBerry® when the price is achieved. “This functionality provides farmers with the confidence that they’re not going to miss out on a favourable elevator bid,” says Fletcher. Realizing the opportunity, GFO teamed up with FloatPoint Media Inc., a BlackBerry® Select Alliance Member, to design SellSmart. FloatPoint specializes in custom mobile application development and understands the value of mobile technology to modern agriculture. GFO also partnered with AML Communications, a Rogers authorized dealer, to provide a BlackBerry® Torch smartphone to one prize winning farmer and together they are working on a member discount package to help all Ontario grain farmers gain access to the application through cost effective mobile connectivity using BlackBerry® technology and the Rogers Network. SellSmart can be downloaded to any BlackBerry® OS 5.0+ device, free of charge, at www.gfo.ca/SellSmart or through BlackBerry® App World. Although it was designed with farmers in mind, the application will also be useful for grain elevators, buyers, and users. SellSmart is exclusively available for BlackBerry® smartphones at this time, however, GFO has plans to extend the application to other platforms in the New Year. Questions can be directed to info@gfo.ca. INGERSOLL, ON (December 14, 2010) – Winners of the Grain Farmers of Ontario (GFO) Soybean Yield Challenge were announced today at a banquet in Ingersoll. The three finalists for each of three provincial soybean maturity zone received prizes, for a total of nine winners. With an average yield of 61.6 bushels per acre among all challenge participants, there is no doubt that this was a winning year for soybeans. “In many parts of the province, the weather was perfect for soybeans this year. We got lots of heat and many regions received rain at near-perfect times throughout the growing season,” says Crosby Devitt, Manager of Research and Market Development at GFO. The winners in each zone received a cash prize and all winners and runners up received tickets to Canada’s Outdoor Farm show and their local farm show – London, Toronto or Ottawa. The overall winner with the highest yield of all zones received a trip for two to the International Farm Machinery Show in Louisville, Kentucky. GFO is the newest and largest commodity organization in Ontario, representing Ontario’s 28,000 corn, soybean and wheat farmers. The three crops cover 5 million acres of farm land across the province, generate over $2.5 billion in farm gate receipts, result in over $9 billion in economic output, and are responsible for over 40,000 jobs in the province. GFO is poised to have a significant impact on Ontario agriculture. The Soybean Yield Challenge would not be possible without our generous sponsors. Special thanks to our Platinum Sponsors: Pride Seeds, Syngenta Seeds, BASF, Hyland Seeds, HiStick, Pioneer Hi-Bred, Monsanto and Dekalb. Thanks to our Gold Sponsors: Bramhill Seeds, Maizex, Country Farm Seeds and SeCan.